Associated Press photographer and 2017 World Press Photo Contest winner Burhan Ozbilici, right, is interviewed by Lars Boering, managing director of the World Press Photo Foundation, in front of his winning picture during a press conference in Amsterdam, Netherlands, Feb. 13, 2017. Turkish photographer Burhan Ozbilici won the prestigious international prize for his photograph of the man who killed Russia’s Ambassador to Ankara, Andrey Karlov, at an art exhibition opening in December. 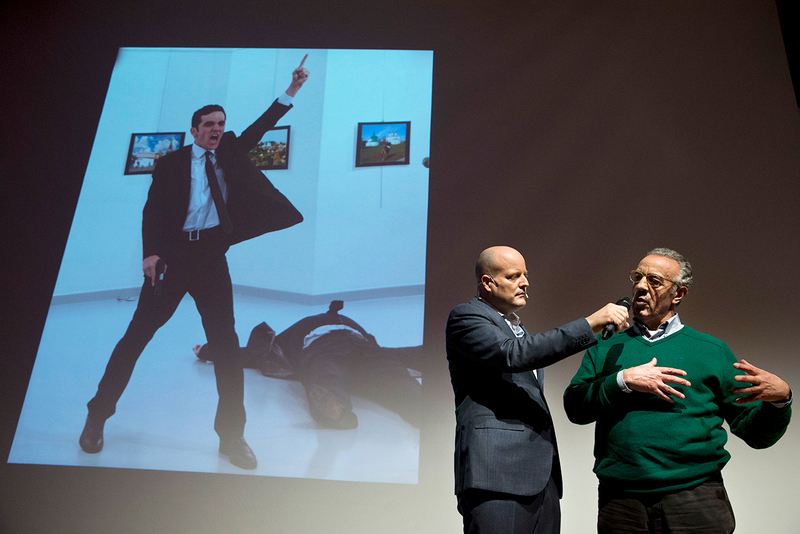 Turkish photographer Burhan Ozbilici won Photo of the Year in the World Press Photo Contest for his image of assassin Mevlüt Mert Altıntaş just after he shot the Russian ambassador at an art gallery in the Turkish capital, Ankara, on Dec. 19. The picture, which was commissioned by the Associated Press, depicts the 22-year old off-duty police officer Mevlüt Mert Altıntaş shouting with a gun in one hand and the other hand held high in the air, as he stood next to the body of Ambassador Andrey Karlov. Altıntaş was killed shortly after by police. Four Russian photographers are among the winners in the contest, which was announced on Feb. 13. Valery Melnikov took first prize stories in the category, Long-Term Projects, with his photograph of civilians escaping a burning house in Luganskaya village, Ukraine, while on assignment for Rossiya Segodnya. Second prize stories went to Elena Anosova in the category, Daily Life, for her image of one of the most isolated parts in Russia’s Far North. Sergey Ponomarev won second prize stories in the category, General News, for his picture of a family fleeing the fighting in Mosul, Iraq’s second-largest city, as oil fields burned. He was on assignment for The New York Times. Kristina Kormilitsnya won third prize singles in the category, People, for her photograph titled, Fidelity, which shows a woman and a child sitting in a police station in Cuba with a portrait of Fidel Castro behind them on the wall. The image was made in response to the death of the revolutionary leader, and commissioned by Kommersant.